Crows Fashion Special Hook Tools For Insect Hunting! to hunt for insect prey. 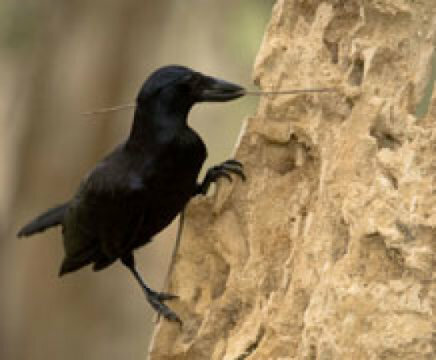 A few days ago, scientists reported how they have been given an extraordinary glimpse into how wild New Caledonian crows (Corvus moneduloides) make and use 'hooked stick tools' to hunt for insect prey. Dr Jolyon Troscianko, from the University of Exeter, and Dr Christian Rutz, from the University of St Andrews, have captured first video recordings documenting how these medium sized, all black crows fashion these particularly "complex" tools in the wild. The two scientists developed tiny video 'spy-cameras' which were attached to the crows, to observe their natural foraging behaviour. The findings appeared in the Royal Society's journal Biology Letters on Wednesday, December 23. "While fieldworkers had previously obtained brief glimpses of hooked stick tool manufacture, the only video footage to date came from baited feeding sites, where tool raw materials and probing tasks had been provided to crows by scientists. We were keen to get close-up video of birds making these tools under completely natural conditions. New Caledonian crows are notoriously difficult to observe, not just because of the challenging terrain of their tropical habitats, but also because they can be quite sensitive to disturbance. By documenting their fascinating behaviour with this new camera technology, we obtained valuable insights into the importance of tools in their daily search for food." said Dr Troscianko. The scientists were excited to record two instances of this behaviour on footage recovered from ten birds in their latest study. "The behaviour is easy to miss -- the first time I watched the footage, I didn't see anything particularly interesting. Only when I went through it again frame-by-frame, I discovered this fascinating behaviour. Not once, but twice!" said Dr. Troscianko. Still images from footage obtained with miniature video cameras attached to wild new caledonian crows.